California Approves $500 Fines For Residential Water-Wasters : The Two-Way Residents will have to pay for wasteful outdoor watering, including hosing down driveways and washing a car without a shut-off nozzle. Sprinklers water a Sacramento, Calif. lawn Tuesday morning. Californians who waste water will have to pay up to $500 a day for their extravagance under new restrictions approved Tuesday by the State Water Resources Control Board. The move comes after the board concluded that voluntary conservation measures have failed to achieve the 20 percent reduction in water use that Gov. Jerry Brown was hoping for, reports The Associated Press. 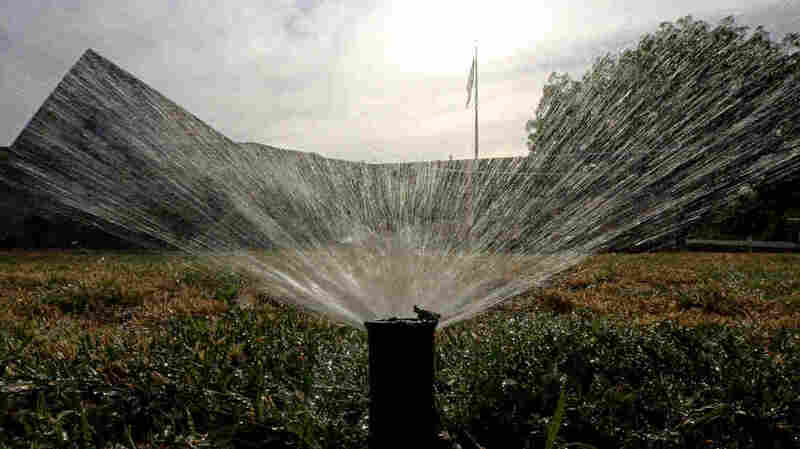 In fact, a survey by the board showed a 1 percent increase in water use in May compared to the same month a year ago. Residents will be fined for wasteful outdoor watering, including "watering landscaping to the point that runoff flows onto sidewalks, washing a vehicle without a nozzle on the hose, or hosing down hard surfaces such as sidewalks and driveways," AP reports. Also banned: using drinking water in ornamental fountains that don't recirculate, and washing a car without a shut-off nozzle. Although several southern state agencies have made significant cuts in water use in recent years, most residents just don't understand the seriousness of California's three-year drought, the worst since the 1970s, said Madely Glickfeld of the UCLA Institute of the Environment and Sustainability. According to the Los Angeles Times, Glickfeld cited "lush lawns and freeway sprinklers spraying next to the electronic Caltrans signs urging water savings." Water board Chairwoman Felicia Marcus told the AP that the fines will spread the burden of the drought beyond farmers to city and suburban residents. "Our goal here is to light a fire under those who aren't yet taking the drought seriously," she said. "We're all in this together."